decor8 Reader Question: Curtain Help Anyone? A question arrived from decor8 reader Jonis, she needs window treatments in her new home. Her walls are painted Lancaster Whitewash by Benjamin Moore and the furniture is chocolate brown velvet. 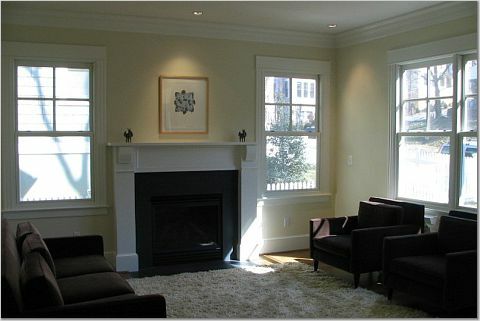 This is a snapshot of her formal living room, and because it's formal she's perfectly fine with dressing up the windows a bit and investing in fabric and quality rods. - She's happy to find fabric and have them made, but would love suggestions on style if you can think of something. Or a textile that you suggest. -Repainting the walls is not an option. - Not into pattern or a lot of color. She wants to keep things somewhat neutral and not too trendy. She'd like to introduce color mostly through art and pillows. First Jonis, if you aren't into pattern or bold color, think about introducing texture to the room because that will warm things up and make the space look finished (now it's a bit lonely in there!). Consider adding some pattern in small doses, perhaps neutral-toned panels with a patterned trim (something geometric like a greek key motif). Trim introduces a little action to the room without overpowering it. You can then add a bamboo blind peeking through for privacy at night so you don't have to worry about opening and closing the curtains constantly. The wood would look nicely with your furniture and bring in texture. You can find great blinds at Target for a low price and you're in luck because they can be installed outside of the window frame (drapes hide that anyway) so you don't need them to be sized to fit. You can also opt for drapes with patterned or solid trims (where you will introduce a color) along the bottom instead of the sides. 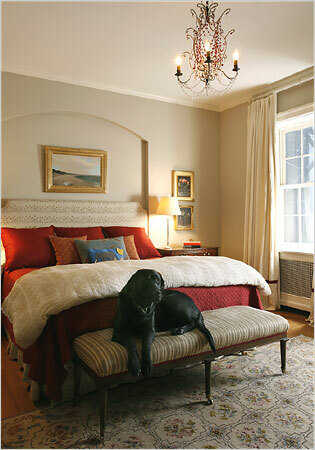 To give you a quick visual, refer to the image below of Ann Brashares and Jacob Collins?s NYC bedroom for example. And notice how the rods are installed as close to the ceiling as possible, perfectly okay to do and adds height to the room. You have gorgeous crown molding so I'd install them just below that (if your drapes do not have a ruffle) and on the window frame if there is a ruffle.